Protecting sensitive data by encrypting it and then shredding the original is a must need set of job every professional needs to do. I have wrote about a few software that can do those jobs separately but only few are present that can do both jobs but none integrated both jobs at one go. Kryptelite is a free software Encrypts Sensitive Files & Folders using industry-standard AES cipher & with ZIP and BZIP2 Data Compression and then shreds the original so that it couldn’t be recovered. Kryptelite is an excellent choice for those users who use encryption only occasionally. While it lacks bells and whistles of the more advanced editions, it still does the job perfectly and provides the same highest level of security. The installer (7.51 Mb) is digitally signed by Inv Softworks LLC. The software installation is fast and clean. Installation is multilingual; English, Spanish, German, Russian languages are supported. Desktop icon is created automatically. None of the installation & uninstallation requires restart under normal conditions. In very rare cases, the installer may request system restart. After restart the system will ask your permission to run a program giXXXXXX.exe (where XXXXXX is 6 random letters and digits). Please allow it – that program is a part of the Kryptel installer, and should be run to finish installation properly. Uninstallation do not leave traces. It also offers Repair & Add/Remove Features function during uninstallation. Quick Tutorial is opened at the end of installation. The software can run on Windows 2000 to Window 7. Both 32 & 64 bit are supported although the software is natively 32 bit. The software is light on resources during idle time but consumes moderately high resources during encryption. Unlimited file size: While Kryptel does not limit file size, operating system limitations may apply. For instance, FAT32-formatted drives cannot hold files larger than 4Gb. Strong encryption using industry-standard AES cipher. Effective ZIP and BZIP2 data compression. The Desktop icon is set to open Encrypt/Decrypt Wizard upon a double-click. The software shows Encrypt & Shred entries on the right-click menu of all files & folders & shows Decrypt, Verify & Shred entries on the right-click menu of all encrypted files. 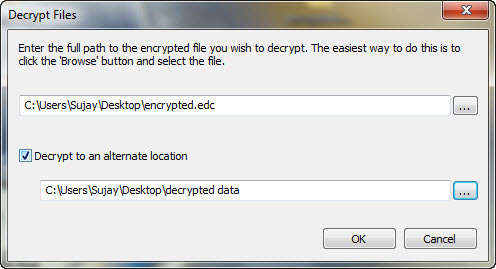 File & Folders can be encrypted either from the Right Click menu or via the Encrypt/Decrypt Wizard. Right Click encryption is faster. It just asks for the password to encrypt and creates the encrypted file (.edc) with the same name of the original file. Encryption via Encrypt/Decrypt Wizard is a bit lengthy (step 1, 2, 3, 4 & 5) but will allow you to set the location and filename of your choice. Kryptelite does not allow forming the encrypted archive at the root of a hard drive. So, if the file/folder to be encrypted are attempted to encrypt via right click menu, an error message will be shown. Those file/folder should be encrypted using Kryptel Wizards. The software supports drag & drop during addition of files/folders to the encrypt list. By default the software asks to enter password just once during encryption. You may also see the entered password and enter it twice. By default the software displays or hides entered password based on previous selection but it can be set to hide or show always. There is an option to force the password to be entered twice during encryption & also to set it case-sensitive. The encrypted file may be verified for any error from right click menu. It may also be set to verify after encryption. When multiple files/folders are selected and encrypted via right click menu, multiple encrypted files have been created. To create a single encrypted file either use the Wizard or set the software to produce single file upon encryption. Decryption of encrypted file may be carried out quickly from right-click menu or via the wizard. 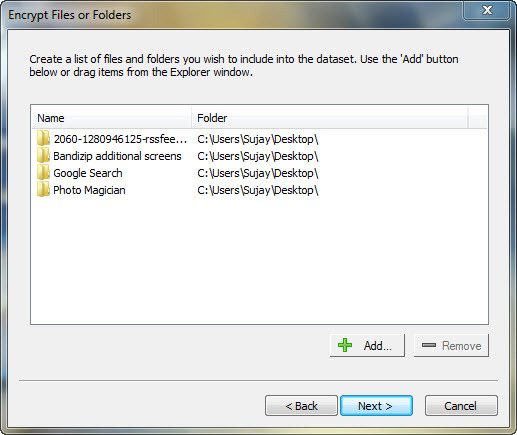 The wizard is lengthy (step 1, 2 & 3) but will allow you to set the destination folder of the extracted files. Both encryption & decryption takes place fast. After encryption, source file/folder and after decryption the encrypted container will be shred (1 Pass) in the background for security purpose. This behavior may be changed upon user decision. The software may also be used as a shredder. Files/Folders may be shred via right-click menu. it will just show an alert and will start the processing in the background. 1 pass shredding is used which is quite enough. The software allows you to change the icons being displayed. The software has an well documented offline help file. The software is excellent in its category. Paid versions offer better protection but for basic users, this software is quite enough. I would like to request the developer for removing the ‘show’ password feature or keep it an optional feature. This is dangerous if a screenlogger is installed in a PC. Like always, I think that a portable version would be great for the popularity of the software. An auto-update check would also be beneficial. This entry was posted in Encrypt, File Management, Free, OS Enhancement, Privacy Related, Security Related, Shred, Software, Windows. Its' optional, and can be turned off. Unfortunately, this won't help against a keylogger. The paid version includes a set of virtual keyboards, but they are not available in the free edition. It's available in the paid edition.